Beginning Thursday November 17, Metrograph will present a retrospective of Takeshi "Beat" Kitano, all in 35mm. 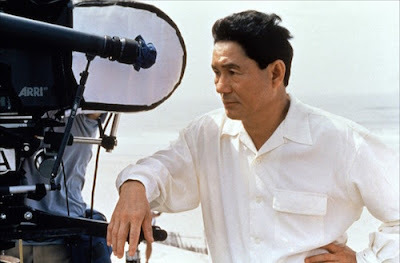 Comedian, television host, painter, author, producer, distributor, and all-around superstar, Kitano is best known to international audiences as one of the great contemporary filmmakers. As an actor he’s a preternaturally calm, eternally impassive presence, billed as “Beat”; as a director, he’s all about rhythm—the long quiet lull before a storm of violence, the canny delivery of the ace comic. Watching Kitano’s films, one learns to expect the unexpected, whether it’s a swiftly-delivered chopstick into the brainpan or Kitano’s radical shifts between bleak yakuza films, contemplative character pieces, and ventures into wistful comedy. Co-Presented with the Japan Foundation. It’s exactly what the title says. In Renaissance man Kitano’s first outing as film director-star he plays hard-drinking, chain-smoking deadpan police detective Azuma Ryosuke, a man of few words who prefers to let his fists and firearms do the talking for him, shackled with a rookie partner while hot on the trail of a drug kingpin. This is the invention of a new action star: Quiet, compact, observant—and always poised for the fatal strike. When Masaki (Masahiko Ono), a minor-league baseball benchwarmer moonlighting as a gas station attendant, finds himself at odds with the local yakuza who’ve attacked his coach, he has to get himself a gun and a little backup in the form of an Okinawa gangster (Kitano) with a grudge, and a genius for causing pain. A darkly-comic second film, which finds Kitano’s mature mastery already in place. A hard turnabout from his early, brutal thrillers, the poignant A Scene at the Sea displays a softer side of Kitano—the story of a deaf garbage collector (Kurôdo Maki) who, after digging a smashed up surfboard out of the trash, begins to pursue a dream of riding the waves, facing the derision of seasoned surfers and local yokels along the way, and supported by his nevertheless skeptical girlfriend (Hiroko Oshima). Banged-up, middle-aged Tokyo yakuza enforcer Murakawa (Kitano) is tired of the mob life, but he takes on a final assignment to quash a gang war in Okinawa that turns into a hideout holiday. Kitano’s reinvention of the yakuza film is a showcase of surreally-tinged set-pieces, climaxing in a dazzling shootout, all adding up to make the film that established Kitano as the Japanese director of the moment. Another of Kitano’s slightly-cracked dreamers, thirtysomething loser Asao (Dankan) aspires to nothing greater than doing the nasty in a car, but first he needs a girl and some wheels. Trying to scrape together the money leads him through a string of misadventures, from appearing in a Zatoichi movie to selling off his grandfather’s internal organs. An inspired, raunchy, anything-goes spoof of Japanese culture which returned Kitano, who pops up as a mad scientist, to his knockabout comedy roots. Kitano lends his laconic, meditative style to a melancholy character study of two feckless boys, petty hoodlum Masaru (Ken Kaneko) and his shy best friend, Shinji (Masanobu Ando), at the end of their high school careers, floundering about while looking to find a place in society. The peerless ensemble cast includes a comic duo who seem like they might actually make it out of this dead-end world—an autobiographical note revealing the unmistakably personal nature of this project. The two sides of Kitano’s directorial personality, the warm, tender, observant dramatist and the master of controlled chaos, merge effortlessly in this, perhaps his best-loved film. Retired detective Nishi (Kitano) turns to duplicitous means to look after his dying wife (Kayoko Kishimoto) and his wheelchair-bound ex-partner (Ren Osugi), but when the yakuza come to collect on a debt, well, he has to take care of them, too. The title means “Fireworks,” and they’re glorious. Kikujiro (Kitano) is another of the director’s yakuza heroes, but here entrusted with a very different kind of mission—he’s transporting nine-year-old Masao across Japan, looking for the boy’s mother. A gentle, big-hearted slapstick road movie peopled with public park pedos and benevolent Hells Angels, whose relaxed pacing allows for the minute development of ingeniously worked-through gags, including a classic bit at a rural bus stop. The cult of Kitano was international by the time this largely English-language American-British-Japanese co-production appeared, with Kitano as an exiled yakuza who finds himself at loose ends in Los Angeles, where he gets involved with a drug ring run by his half-brother and a partner (Kurôdo Maki and Omar Epps), and teaches the Yankees a thing or two about how to make their competition disappear. Another radical departure from formula for Kitano, this gorgeously stylized, almost ritualistic omnibus film is comprised of three slightly-overlapping stories, united by their touching, pensive tone, their focus on tragic relationships marked by acts of self-sacrifice, and the shared source of inspiration in the Bunraku puppet plays of 17th century writer Monzaemon Chikamatsu. A rich, elegant piece of work. When Kitano started out as a director, he gave a shot in the arm to moribund Japanese pop cinema, so it was only appropriate that he would eventually breathe new life into one of the most beloved of samurai franchises. “Beat” plays the title role himself, defending villagers from an out-of-control yakuza gang war in a festival of slicing and dicing that ends (of course!) with a show-stopping dance number. Screening As Part of "Welcome to Metrograph: A-Z"
One of the most iconic films produced by Office Kitano, Jia Zhangke’s intimate epic begins in and returns to the director’s hometown of Fenyang, Shanxi Province. Platform follows a theatre troupe over the course of a decade as they are scattered to the wind and finally return, along the way tracking the social shifts that accompany China’s move from the wake of the Cultural Revolution to the threshold of market capitalism. “It’s Pop Art as history.” (J. Hoberman) Metrograph presents the rare, 210-minute extended cut on an imported archival print. Special thanks to producer Shozo Ichiyama and Office Kitano.